Keeping up with the ever-changing furniture trends can be a challenge. 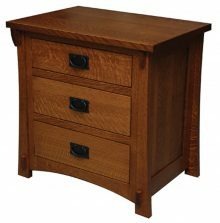 But when you purchase solid wood Dutch Country Mission bedroom furniture from AmishOutletStore.com, youll get a classic furniture piece that never goes out of style. The Mission furniture style has endured for well over a century and is sure to remain popular for many years to come. One of the most appealing features of Amish furniture is how timeless it looks. The straight, clean lines and beautiful natural grain in the hardwood look great in any décor. They can match a classic, rustic style or a more contemporary style of home or room. You can pick complete Dutch Country Mission bedroom sets, or choose individual pieces that match and contrast with your existing furniture. 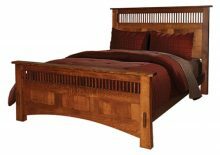 To make it even easier to find that right bedroom collection, at Amish Outlet you can customize your furniture. In just a few clicks right here on our site, you get to pick your wood. You also get to pick your stain, allowing you to truly customize your bedroom furniture to highlight the natural woodgrain beauty. The rich, deep stains we use not only look great, but also provide durable protection against daily wear and tear. 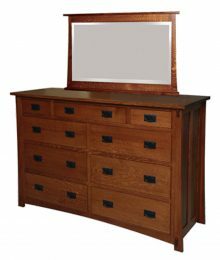 Our Dutch Country Mission bedroom furniture collection includes a gorgeous panel bed, as well as a variety of nightstands, dressers, chests of drawers and more. Purchase that one piece that your bedroom has been sorely missing, or mix and match to create your own customized bedroom furniture set. All pieces are made from the finest northern kiln-dried hardwoods such as Oak, Cherry, Q.S. White Oak and Maple. The end result is a sturdy furniture piece that is sure to become a treasured family heirloom. Do you have a small bedroom and have trouble finding furniture that fits? There’s no worries with our Amish Dutch Country Mission bedroom collection. 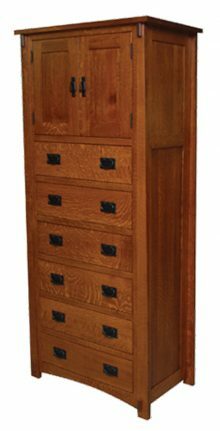 We offer many different shapes and sizes of dressers and armoires, meaning you can select the option that fits your space. 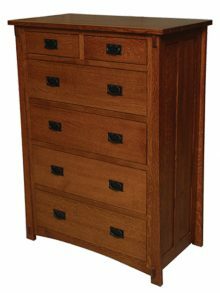 Our chests of drawers come in several different widths and heights and a multitude of drawer and door options. This kind of flexibility can’t be met by most mass-producers, who limit you to a few simple choices. They build on assembly lines optimized for fast production. Ohio Amish Country artisans, on the other hand, treat each piece of furniture as a unique work of art. They select each piece of wood for a harmonious appearance, according to its color and grain. They work the wood according to age-old Amish woodworking techniques, and assemble and join everything for a solid final product. The last steps — staining the furniture and adding any necessary hardware — get the same attention to detail, and the result is your custom Mission bedroom furniture ready for use in your home. AmishOutletStore.com is located in the picturesque village of Smithville, OH near the heart of Ohio Amish country. This enables us to employ the services of highly-skilled Amish master crafters who construct each Dutch Country Mission furniture piece by hand. With the Amish, the focus is always on the quality of the finished product, not the number of pieces they can churn out on a given day. Youll benefit from a level of craftsmanship and attention to detail that you wont find in furniture that comes from those big box stores. When you purchase furniture from a mass-market producer, you may not know where it comes from. Many mass-producers purchase their furniture from overseas, where worker safety and environmental concerns may exist. If you’re like us, you’d rather know that your furniture has been built right here in the USA, by hardworking Americans. 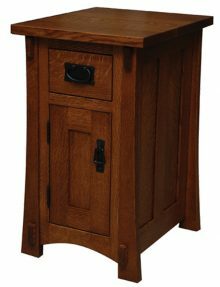 In the case of Amish Mission furniture, you’re getting over a century of experience and knowledge in each piece. 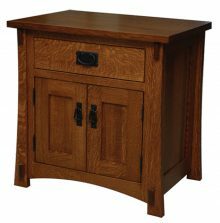 Your new solid wood Amish furniture will earn a place of prominence in your home. Think about a Mission bedroom set for every member of your family! 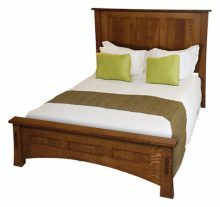 We have many great options in beds, dressers and night tables. You can also add unique accessories from our other collections for a fun, mix-and-match look. In just a few clicks, you can see all of our Dutch Country Mission bedroom collection pieces and start your customization. You’ll choose from our various northern, kiln-dried hardwoods, and pick the stain that best shows the grain and color you like. Once your order is placed, it’s time for our hardworking Amish artisans to get started, turning your vision into reality. As a valued AmishOutletStore.com customer, you have the opportunity to save money on beautiful Amish-made furniture. We offer volume discounts for larger purchases, as well as special monthly promotions throughout the year. If you buy right now, you can even take advantage of an up to 33% discount off the regular retail price on all Dutch Country Mission bedroom furniture pieces! 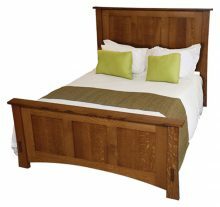 Browse our current selection of handcrafted solid wood Dutch Country Mission bedroom furniture. Use our handy online design tool to experiment with different hardwood options and stains to create your own furniture masterpiece. Have fun customizing and dreaming! Order your new bedroom furniture today here on our site or give us a call at 1-800-217-6999.